A recent thread On An Overgrown Path that culminated in a reader's assertion that it's OK to program something that isn't perfect, received widespread support. This strand was an extension of my argument that audiences need permission to like unfamiliar music. In turn this reflected the response of "I've always felt that it is and will be strong enthusiasm that will change the world" by the much-missed Jonathan Harvey to my early advocacy of his music. But despite this, I am proposing today rather contrarily that excessive enthusiasm as well as excessive neglect can harm a composer's music. In his 1961 book The Image: A Guide to Pseudo-Events in America the historian Daniel J. Boorstin coined the term 'pseudo-event' for events that are staged specifically to attract media coverage. He asserted that pseudo-events are in reality 'synthetic news', and that manipulation to maximise media exposure reduces the spontaneity and intrinsic merit of the event. In The Image Boorstin discusses pseudo-events in the context of art; suggesting that the pursuit of accessibility has turned art into a commodity, and that pseudo-events distance audiences from the felt experience, an effect that he terms 'disembodying'. The Situationist Guy Debord took a more extreme view of this commodification in his 1967 treatise The Society of the Spectacle, proposing that "passive identification with the spectacle supplants genuine activity" and observing that we need "to wake up the spectator who has been drugged by spectacular images". Like Marshall McLuhan's paradox that the medium is the message, Boorstin's theory of pseudo-events predates digital technologies and social media by decades. But despite this it is very relevant today; because pseudo events provide social media with its click bait lifeblood, and an infatuation with accessibility and new technologies means that virtual experiences - pseudo-events by another name - take precedence over visceral engagement. The theory of pseudo-events can be productively applied to the topical subject of neglected composers; that is Havergal Brian in the photo above and I will use him as a case study. The Havergal Brian mythology is celebrated and has become a pseudo-event in its right. The myth tells how he was the most prolific 20th century composer, that he was the longest-living active composer, that he composed the longest symphony ever written, that when he died aged 97 in 1982 not a note of his music had been commercially recorded, and that therefore he ranks as the most neglected composer in the history of music. Some of which is true, but some false. 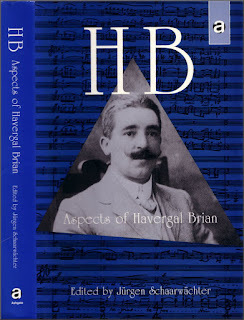 In the foreword to the highly recommended HB: Aspects of Havergal Brian, the authority on the composer David J. Brown points out that between 1954 and 1980 there were a number of broadcast performances of Havergal Brian's music due to the advocacy of BBC producer (and distinguished composer) Robert Simpson. 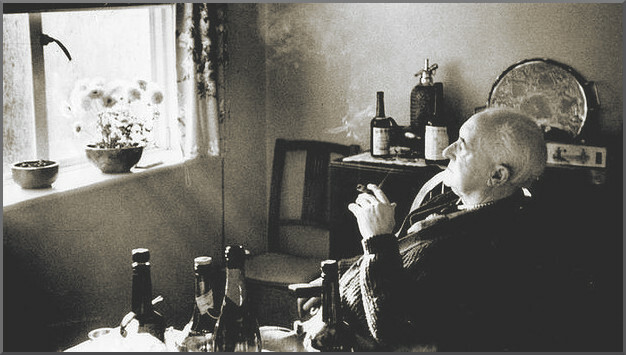 Moreover in the last decade of his life Brian became something of a minor celebrity - note the tell-tale champagne bottle in the header photo - and unlike many other 20th century composers, interest in his music has not diminished since his death. It is of course clear that not all [Havergal Brian's] compositions are of the same high quality, but whose are? It might have been better to pick out the best of his works, instead of getting Marco Polo to record all 32 symphonies, with not always first-rate results. Havergal Brian's Gothic Symphony provides an illuminating case study of the perils of pseudo-events. Before 2011 there had only been two performances of Brian's symphonies at the BBC Proms. So Proms director Roger Wright decided to correct that in style. Now Roger Wright was responsible almost singlehandedly for making pseudo-events a classical music fixture, including broadcasting nothing but Schubert's music for eight days in 2012. So the Havergal Brian correction came in the form of a pseudo-event par excellence: a first night performance of the 110 minute choral Gothic Symphony, backed by the BBC's mighty spin machine complete which cited the symphony's place in the Guinness Book of Records. Of course we should programme music that isn't perfect. But excessive enthusiasm can harm a composer's reputation; particularly when the hype takes the form of a pseudo-event showcasing a not entirely representative work. 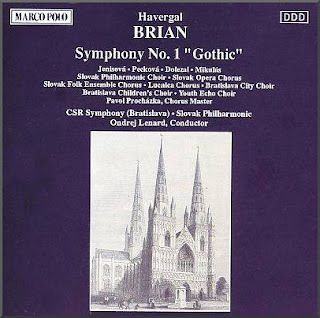 The Gothic is the first of Havergal Brian's catalogued symphonies, although there is an earlier lost symphony. What a difference it would have made to the reputations of Beethoven, Mahler and Mozart if we judged them solely on their first symphonies. 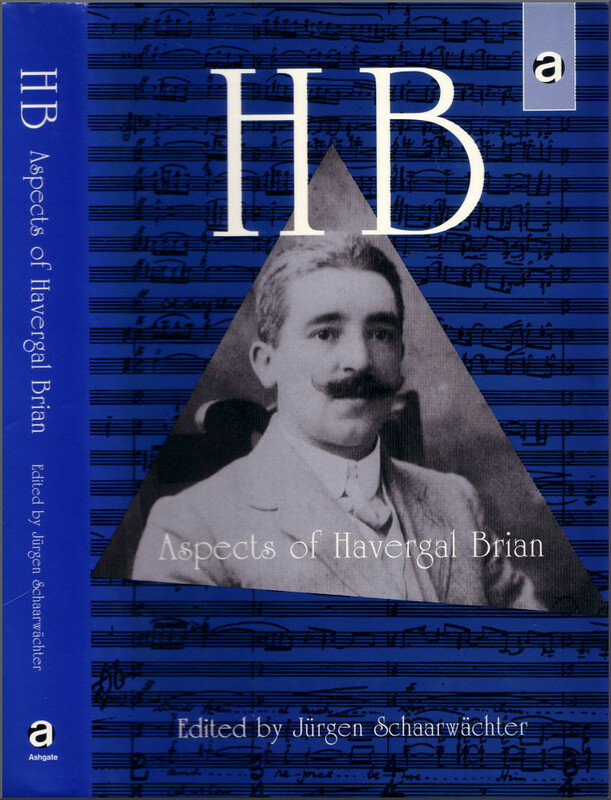 As Havergal Brian matured his compositions became more succinct, better argued, and as a result more meritorious. His last symphony - No. 32 - was composed when he was 92. It lasts for just twenty minutes and is scored for much smaller forces than the Gothic, while his 'Symphonia Brevis' (No. 22) lasts for just nine minutes. Thankfully, others have recognised that there is more to Havergal Brian than the Gothic. In 1972 Unicorn recorded Symphonies Nos. 10 and 21 in outstanding performances by the Leicestershire Schools Symphony Orchestra (LSSO). This was the first recording of his music to be released commercially and is still available - see below - coupled with CBS' 1974 recording of Symphony No. 22, 'Symphonia Brevis'. These were the recordings that won many - including this writer - over to the Havergal Brian cause. If you do not own the CD transfers do not be put off by the amateur status of the orchestra. At its peak the LSSO was arguably the equal of the National Youth Orchestra. This is fiendishly difficult music to play; but any minor intonation aberrations are more than compensated for by the sheer commitment of the young players. 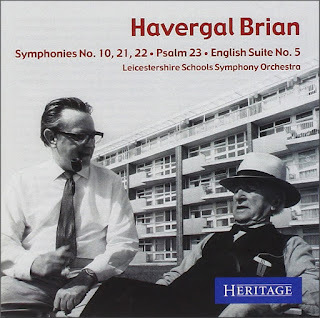 Total commitment is what Brian's music needs, and the playing of the Leicestershire youngsters makes some of the more recent recordings of his symphonies by professional orchestras sound like first read-throughs. That is Robert Simpson with Havergal Brian on the disc cover; Simpson produced the LSSO recordings with the exception of the English Suite, and all were engineered by Angus McKenzie. In addition to my day job in the music industry I did a lot of freelance writing for Hi Fi News in the 1970s when Angus Mckenzie was a regular contributor of uncompromising pieces on the vital importance of recorded sound quality. In those days we were all evangelists of sound quality; by contrast in today's brave new MP3 world recorded sound quality scarcely gets a mention in record reviews . Angus McKenzie was a legend among tonmeisters, not only for his golden ears but also because he was probably the only blind member of the British Astronomical Association. More than forty years after they were committed to analogue tape his recordings of Havergal Brian's symphonies reproduce with a visceral impact that puts recent digital recordings in the virtual shade. This music demands totally committed playing and sonic slam, and the Leicestershire Schools Symphony recordings deliver both in bucket loads. If you are a Havergal Brian convert they should without a doubt be in your collection. If you are a Havergal Brian doubter they should without a doubt be in your collection because they will almost certainly convert you. In an outstanding recording for EMI - now deleted - Sir Charles Mackerras, who championed Brian, wisely coupled the Seventh Symphony - one of Brian's most accessible works - with the 13 minute Symphony No. 31. In 1966 when pseudo-events had not yet become a major driving force, that supremely intelligent conductor Norman Del Mar coupled the first ever Proms performance of a Havergal Brian symphony - the 12th which coincidentally lasts for 12 minutes - with a Beethoven piano concerto, a Gordon Crosse premiere, and Brahms' Fourth Symphony - see programme below. To enhance a composer's reputation the right amount of enthusiasm is needed, and slipping a concise Havergal Brian symphony in with two mainstream classics is the right way to do it. All of which leads me to suggest, with tongue firmly planted in cheek, that a pseudo-event could be created around Havergal Brian's 9 minute 10 second 'Symphonia Brevis' by hyping it as the world's shortest symphony. But is it? Please could erudite readers enlighten us as to what is the shortest symphony by an established composer. You can exhibit fifth-rate painters without too much waste, but time which music must illuminate, cannot be wasted, and only a small proportion of music is worthwhile; in this field we are the more compelled to discriminate. There is a danger in thinking that if a composer is neglected he is something special! Even so, we must find out - both advocacy and rejection should come with knowledge, not hearsay, and it is in any case the duty of a public body like the BBC to give the listener, without obvious limits, the chance to judge for himself; most listeners can't read scores and their only means of judging is through the ear. And it's the listeners right to ask for it and to receive a sensible, fair reason for non-compliance. That copyright minefield YouTube contains many Havergal Brian symphonies. Better to search for CDs listed above - the deleted Mackerras/Groves can still be found - but, if you must, sample Sir Charles' account of Symphony No. 31 on YouTube here. Header photo source Sydney Morning Herald. No review samples used in this post. Any copyrighted material is included as "fair use" for critical analysis only, and will be removed at the request of copyright owner(s). Also on Facebook and Twitter. I was at the Gothic premiere- I found the piece a very fascinating failure. 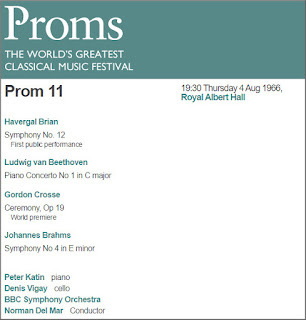 It was certainly one of the most interesting, memorable and thought-provoking Proms I've been to. It certainly sparked a lot of conversation and the blog post I wrote post concert was one of the most popular I've ever done. Interestingly, I'm told Roger Wright disliked the piece and didn't want to do it but felt he had to. I was going to say that it is very pleasing that this article is receiving such a large readership despite not mentioning the EU referendum. But perhaps it is receiving such a large readership because it does not mention the referendum. Very thought-provoking! As far as the shortest symphony is concerned, may I venture Anton Webern's Symphony Op.21? Robert Craft's Naxos recording runs for 10:03, but, no doubt, there is something shorter than that! Neglected composers have, I think, often been neglected for good reason. Perhaps their music has suffered from the vagaries of fashion, but often, to my ears, that's because the music simply isn't very good. In my exploration of "neglected Romantic masterpieces" from the likes of Heinrich von Herzogenberg, Albert Dietrich, Weingartner, Ferdinand Ries, etc. I have often found the music quite pleasant whilst listening to it, but I can't recall much of it an hour or two later unlike with, say, Brahms. Now you may say that's because of familiarity, and I kind of agree and, of course, subjectivities such as "taste" certainly play their part. On the other hand, we are subjected to marketing of "niche" and "in the know" music by labels which only compounds the elitist side to "Classical Music". Take me, for example, I just can't get on very well with Stravinsky and Britten, whatever the piece, and I feel like a bit of an idiot because of that response. On the other hand, there are a few "neglected" composers, like Frank Bridge, Edmund Rubbra, Arthur Honegger, William Wordsworth that I respond to very well but you don't hear them on the radio very often! I think where "challenges" arise we get a muted or even negative response. There was much more to Gustav Holst than "The Planets"; when did we last get to hear "A Choral Symphony" or "The Hymn of Jesus" excepting on recordings? And don't get me started on the hermetic world of chamber music! Interesting and you have provoked (much) further thought from me. Excellent post, Bob! There are, in fact, symphonies shorter than the Brevis or the Webern. Kurt Schwerstik's Schrimpf-Symphonie is 5-6 minutes long, and Michael Wolters's Spring Symphony: The Joy of Life lasts sixteen seconds, according to the composer's website. Alex, thanks for the compliment. I deliberately asked 'what is the shortest symphony by an established composer' as a quick Google search had thrown up that Michael Wolters piece and some others that exist on the margins of the definition of a symphony. Cue perhaps for a useful debate about what is an established composer and what is a symphony. Apologies, I overlooked that qualifier! Though I believe that Schwerstik would qualify as "established." To what degree the Schrimpf-Symphonie is verifiably symphonic I cannot say; I have not heard it. No doubt that Havergal Brian has been, shall we say, "hyped" up, but in spite of all of this, bear in mind that many of Brian's symphonies have yet to be heard in this country. I should note that Bernard Herrmann was the first American conductor to perform anything of Brian's, and that was his Doctor Merryheart Overture with the CBS Symphony in the mid-1930s when Brian was practically unknown in this country. I'm sure Herrmann was familiar with some of the early symphonies, especially when he made frequent visits to England in the 1930s and 1940s, which I feel inspired, in part, his scores to the movies "Mysterious Island" and parts of "The Battle of Neretva". That said, it would be nice if an enterprising conductor took on Brian's early symphonies, such as the epic Third with its two concertante pianos, the gargantuan fourth symphony that was inspired, in part, by Brahms' rarely-heard Triumphlied, the dark and beautiful fifth symphony for baritone and orchestra whose setting of Lord Alfred Douglas' "Wine of Summer" is very moving, the dramatic and tempestuous one-movement "Sinfonia Tragica", and the passionate and thrilling seventh symphony, his most approachable large-scale symphony, apart from his boisterous twenty-fifth symphony that is part of the wave of the later symphonies he composed in his eighties and early nineties. Ditto the cello concerto and the Concerto for Orchestra, as well as his operas "The Cenci" and his own take on "Turandot," which I am sure is far and away different not only from Puccini's, but also Busoni's version as well. I doubt if we'll ever see "The Tigers" get mounted, but if any American orchestra or conductor wants to make a name for him/herself, they should program the "Gothic," not because it's a curiosity piece, but because they truly believe in the work's power and magnitude, structural deficiencies aside. That the press and everyone else wants to hype it up is bad enough, but a committed performance from all forces that are martialed together to bring it to the public will negate the over-excitement of the press, because it is the commitment to the music that will, in the end, win the audience over to Brian's vision. By complete coincidence, I was listening to the Schwertsik symphony today- it's an absolutely cracking (and VERY short) piece. He's the sort of composer that makes one shake one's head in despair at the lack of vision of so many concert planners. The music is substantial and attractive, original, melodically compelling, harmonically sly, fun to play and thought provoking. It has wit and pathos. And yet it's not well known at all. There are some very good CDs out there- the OEHMS disc which includes the Schrumpf Symphony is wonderful, and there's a great Chandos disc which includes his Nachtmusiken, which I'm proud to say we gave the US premiere of at Colorado MahlerFest in May. With regard to short symphonies, I am surprised that nobody has mentioned Milhaud's 5 Symphonies for Small Orchestra, which range from around 4 to 6 minutes each in Rozhdestvensky's recording. Of course these are not to be confused with the 11 'proper' symphonies which Milhaud produced later in his career. Regarding "imperfect" works, I am a devote of Schumann, and everything he wrote after about 1845 seems to be categorised as imperfect, yet there are many gems in there for performers who can mine them. Schwartzkopf famously decline to sing the Mary Stuart songs: that was her problem, not ours.